Chinese Year of the Water Dragon! 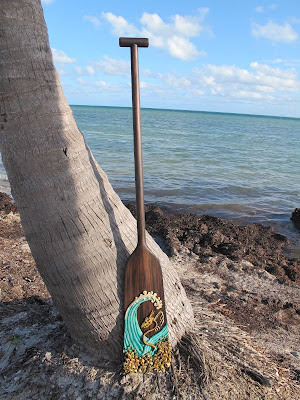 I had fun reinventing this retired paddle from previous Dragon Boat Races. The paddle is up for raffle at this years' race and the proceeds will go to the Cancer Foundation of the Florida Keys. The festival is being held at Sombrero Beach, Marathon, FL. May 12, 2012. Sea Change: The tale of two landlubbers in a little canoe named Suji-Loo. Thanks Chris Dovi and Richmond magazine for sharing our adventure!